Ephenidine is a dissociative drug with a very simple chemical structure. It is generally said to have similar effects to methoxetamine (MXE) but is legal in most places in the world. The effects last around 6 hours and the dosage is around 70-110 mg.
We couldn’t find any reagent test results for ephenidine so we took our own. Note that this sample has not had its identity verified yet. The mandelin reagent goes to a dark green colour within about 10 seconds. The marquis reagent goes to orange fairly quickly, and progresses to a brownish orange over the course of a 60 second test. 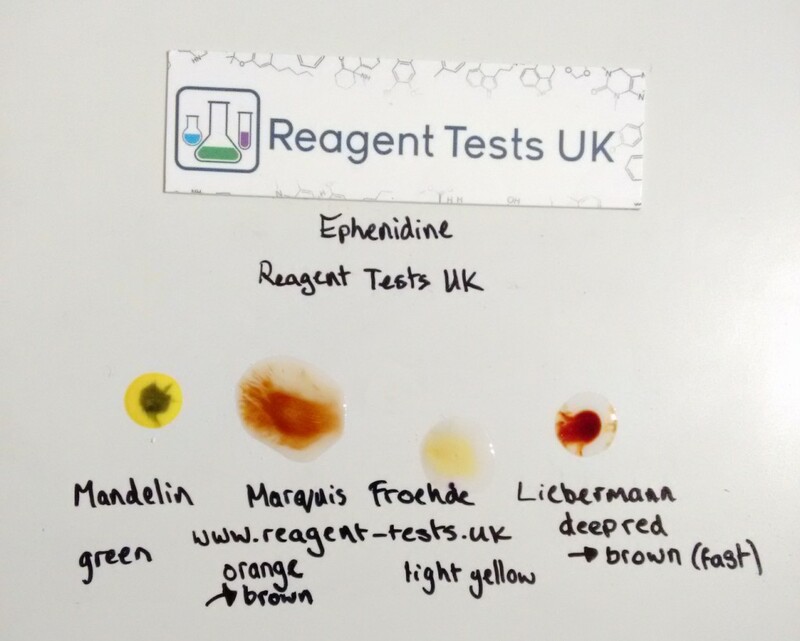 The froehde reagent gives a light yellow colour when reacted with ephenidine. Finally, the libermann reagent goes very quickly to a deep red and then progresses quite quickly into a simlar red with a more brown body.